The USAFL is a non-profit amateur sports organization dedicated to the development of and participation in Australian football in the United States. We serve the Australian football community in the United States. In addition, we further the international agenda of the USAFL’s governing body, the AFL. In everything we do, we aim to further either development or participation in the sport. The United States Australian Football League's (USAFL) first ever game was played in 1996 between Louisville and Cincinnati at Louisville Kentucky. The league was founded the following year in 1997 at the first USAFL Nationals in Cincinnati, Ohio in 1997. 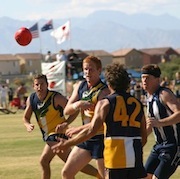 The USAFL is the sole representative of Australian Football within the United States. The USAFL is a grassroots, amateur sports organization dedicated to the development of and participation in Australian football. The organization is focused on the promotion and awareness of Australian football and Aussie culture and has created a sense of community among USAFL clubs and club members. The league also works to foster womens and junior programs across the United States. The USAFL promotes participation by emphasizing awareness and a sense of community within its members and by setting standards by which member clubs agree to abide. In early 2012 the USAFL met with the AFL's International Development Manger, Tony Woods, and developed a five-year strategic plan for the league.